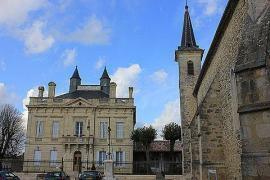 Saint Emilion is found just outside the western limit of the Dordogne, on the road towards Bordeaux. You will recognise the name primarily because of its association with wine - Saint Emilion is one of the four Bordeaux wine regions, and produces some of the very finest wine in the world. The village is surrounded by prestigious vineyards and chateaux, and there are ample opportunities to sample and buy the fine wines of the region. The town itself dates from Roman times - it was also the Romans who introduced wine in the region. The village as it now is has its roots in the 8th century when a monk created a hermitage carved into the rock. 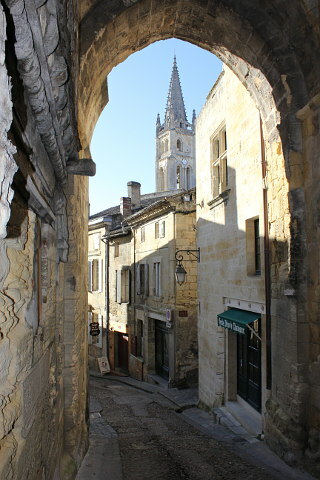 Even without wine, Saint Emilion would very much deserve a visit. It is a very attractive town, built in the attractive local yellow stone and with many historical buildings and monuments to explore along the winding streets. Saint-Emilion is a beautiful town whose historic monuments include an underground church, two cloisters, catacombs, ancient towers and gates. It is also the world's number 1 vineyard and listed, in conjuncion with its monuments as a World Heritage Site by UNESCO. 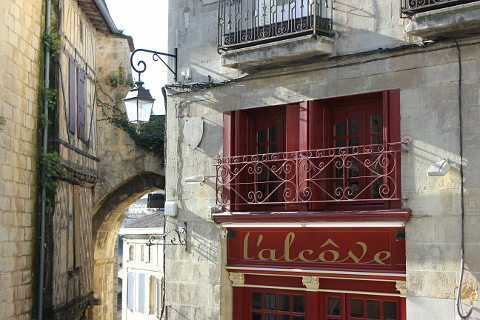 Begin your visit to Saint Emilion at the tourist office at the top of the town. 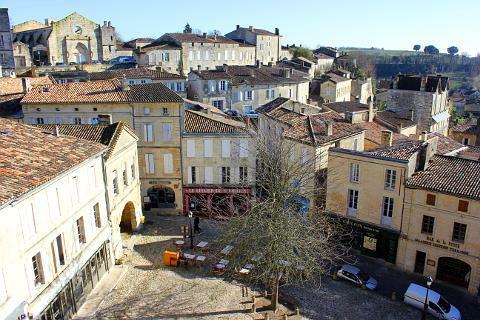 From the lovely square in front of the tourist office you get a view of the town of Saint Emilion as it stretches out below you. Directly below this is the Place de l'Eglise Monolithe, a good place to stop for a cup of coffee and enjoy the sunshine. Surrounding this are the winding narrow streets that criss-cross the town. Each street is lined by beautiful houses many of which are charming shops and boutiques devoted to selling Saint-Emilion's world-class wine whilst the others contain a good number of nice-looking restaurants and interesting shops. 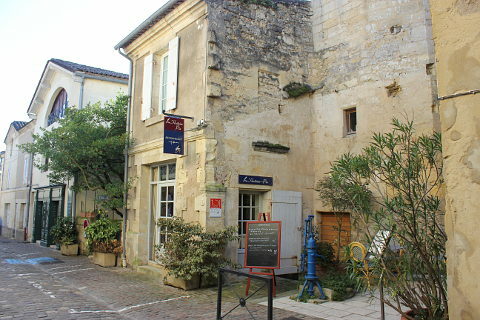 Whilst in the square at the top of Saint-Emilion, next to the tourist office, pay a visit to the Maison du Vin (see below). 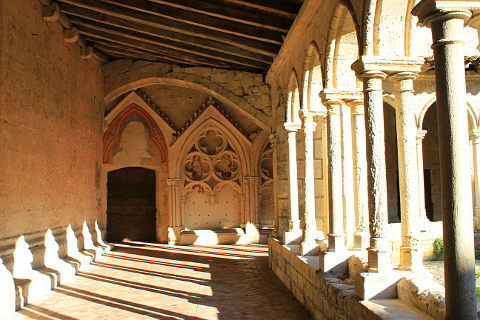 Also visit the Eglise collegiale, a Romanesque church with a beautiful 14th century cloister. The entrance to the cloister is inside the tourist office. 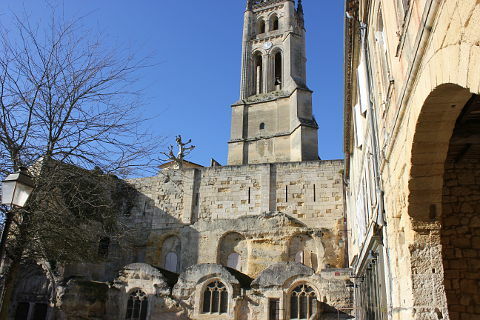 Also here is the lovely bell tower which can be seen from all over Saint Emilion. You can climb the tower for magnificent views over the town and surrounding vineyards. From here walk down one of the narrow, cobbled steps to the Place de l'Eglise Monolithe below and spend some time exploring the narrow streets which fan out from the square. The town rises up steeply to the east and here you can visit another cloister, the Cloitre des Cordeliers. This is a 14th century cloister and also home to the sparkling 'les Cordeliers' wine. Take a seat inside the cloister and enjoy a glass this sparkling wine which has been made in the caves below the cloisters since 1892. Film buffs amongst you might recognise the cloisters from the film "Ma Marié etait si Belle" with Brigitte Bardot. Around the edges of the town there are a couple of ancient stone gateways, on the east side is the Porte de la Cadene, not far from the Cloitre des Cordeliers, and also the Porte Brunet. The Chateau du Roy is a vast 13th century donjon in the centre of town. Climb its 118 steps for great views of the town below. Much of St Emilion is hidden from view, deep underground in a labyrinth of passages and rooms. This part of the town can be visited on a guided tour, during which you will see the catacombs, the buried monolithic church, the grotte where emilion lived in the 8th century, along with the Chapelle de la Trinité. 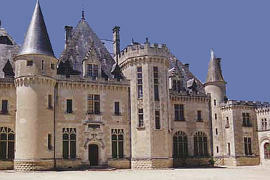 Tours are organised by the tourist office. The tour of these monuments starts in the Place de l'Eglise Monolith and the Monolithic church is inside the rock wall which faces you. The visit begins with the Chapelle de la Trinité. The Trinity chapel was built in the 13th century and dedicated to Saint-Emilion, the town's patron saint, though much of the church dates to the 18th century. 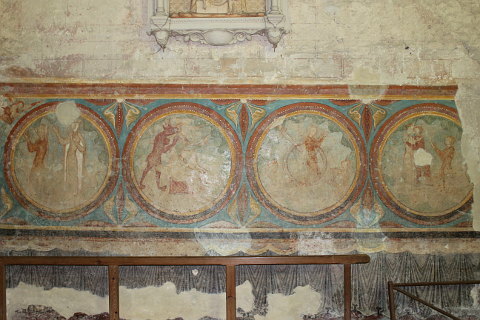 Inside are some extremely well preserved frescoes. Unusually their preservation can be attributed to the French Revolution when many religious monuments were destroyed. The chapel was sold to a wine barrel maker who set up his workshop inside. To curve the wood for the barrels the wood is burnt and the resulting soot covered all the walls. Happily this soot protected the paintings from UV light and in 1997 the walls were cleaned and the preserved frescoes discovered. The oldest monument in the village is the Grotte de l'Ermitage. Saint Emilion was a well-to-do man from Brittany and worked for the Earl of Vannes. He sometimes entered the kitchens of the Earl's castle and stole bread to distribute to the poor. When The Earl discovered this and asked to see what Emilion was hiding under his coat Emilion lied and said wood. When he opened his coat the bread had been turned to wood and he was saved. This was thought locally to be a miracle and Emilion became very popular. To escape his popularity Emilion fled south and became a Benedictine monk. Eventually he came to St-Emilion (called Ascumbas at the time) and took refuge in a cave which became his home for the last 17 years of his life, from 750 and 767. Inside the cave you can see the spring, useful for drinking and baptismal water, his bed carved out of rock and a meditation chair carved out of rock. This is reputed to be a fertility chair and a woman sitting in the chair and praying to become pregnant will fall pregnant within a couple of months. The town was named after Emilion. The Catacombs are graves carved into the rock next to the monolithic church. They appear to predate the church. Later a cupola was carved out to let light in and show the way to heaven. Three men are carved around the cupola, stretching their arms to heaven and symbolising the resurrection. The cupola and the monolithic church are thought to have been sponsored by Peter of Castillon when he came back from the Crusades. He also sponsored the monolithic church at Aubeterre sur Dronne. This church is entirely hewn out of the rock and is the biggest church of this kind in Europe. It is 38m long, 20m wide and 11m high. Impressive! Inside its sheer size is incredible. Unfortunately it now huge metal braces supporting the columns inside and re-inforcing its structure. Originally weaknesses were thought to be due to the weight of the bell-tower up above but it turns out it is more due to the limestone pillars absorbing water by capillary action. The monks it seems had appreciated the problem and put in a system of drains but these had been neglected over the years. Inside the church the walls would originally have been covered in paintings, wall hangings and wooden sculptures but these are long gone. There are some carvings in the stone to see as well as four altars added in the 15 to 18th centuries. 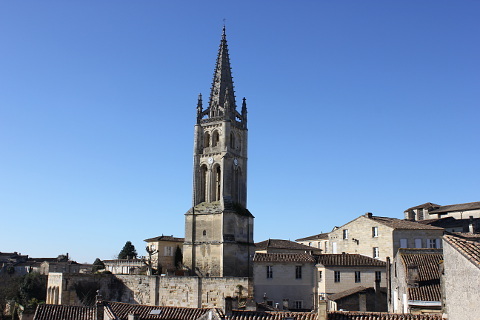 Saint-Emilion has been given UNESCO status as an "outstanding example of an historic vineyard landscape that has survived intact and in activity to the present day". 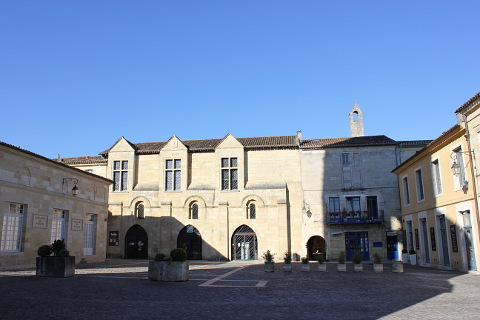 The Maison du Vin, next to the tourist office, is a good place to learn all about the wines of Saint Emilion, their history and their geography. 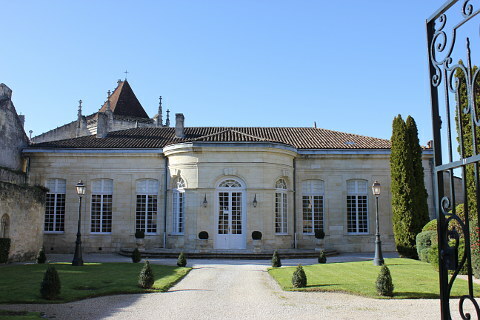 You can take introductory and advanced courses here to discover the wines of Saint-Emilion, Lussac-Saint-Emilion and Puisseguin-Saint-Emilion. There are dozens of wine estates in the vicinity many of whom offer a visit and tasting. The tourist office can give you details. Saint-Emilion wine is classed amongst the best in the world and top of the league are the Saint-Emilion Grand Cru Classé. 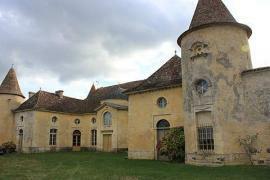 Near to Saint-Emilion is the impressive chateau of Saint Michel de Montaigne. 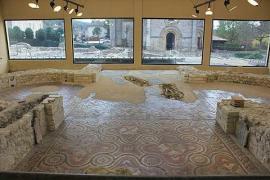 At Montcaret you can visit the remains of a Roman villa which has some very well preserved mosaic floors.